A clean & shiny bike not only looks fantastic, it will perform at its best, for longer. The best way to clean a bike is to methodically go over it by hand, but with these tips cleaning your bike need not be a chore. Why should I clean my bike? There are lots of reasons you should keep your bike clean. Most important of all, it will work better and last longer! A clean bike is less susceptible to wear and corrosion than a dirty bike. Dirt in the chain and (any other moving parts) will abrasively wear down the metal. Muck on the chainring will trap moisture where it builds up, which is an open invitation to rust. Getting up close and personal with your bike is the best way to check for wear and damage too. Did you land a little heavy on your mountain bike while out on the trails today? What about that nasty pothole you caught on your ride to work this morning? While you're cleaning it, you can give the frame, fork and wheels a once over to check for dings & dents and oil leaks, and make sure the welds aren’t growing any hairline cracks. A quick glance is all it takes to check the brake pads and give the spokes a squeeze to check for any loose ones. The first thing to do is clean your chain & drivetrain. If it’s been a while since you last cleaned it, this can be a messy job so it’s best to get it out of the way first and avoid having to re-clean your frame afterwards. Be careful not to let any cleaning solvents or dirty/oily water to get onto your brake pads, especially if you have disc brakes. Oil contamination will render them virtually useless, and no amount of oven baking or any other old-wives-tales will fully recover your contaminated pads. For less intense cleaning sessions, a clean rag covered in chain degreaser wrapped around the chain works wonders, leaving it shiny, smooth and ready to be lubricated (more on that later). 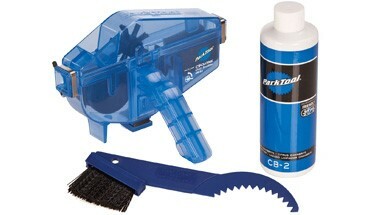 Start off by hosing the bike down to wet and soften the worst of any dried on dirt & grime. Warning: Avoid jet washing your bike up-close using a high pressure washer. High pressure jet washers can force water past the bearing seals in in your wheels, cranks and headset, and even get inside your fork and rear shock. Jet washing from a distance with a lower-pressure isn’t as risky, and cleans very effectively if done as soon as you finish your ride. 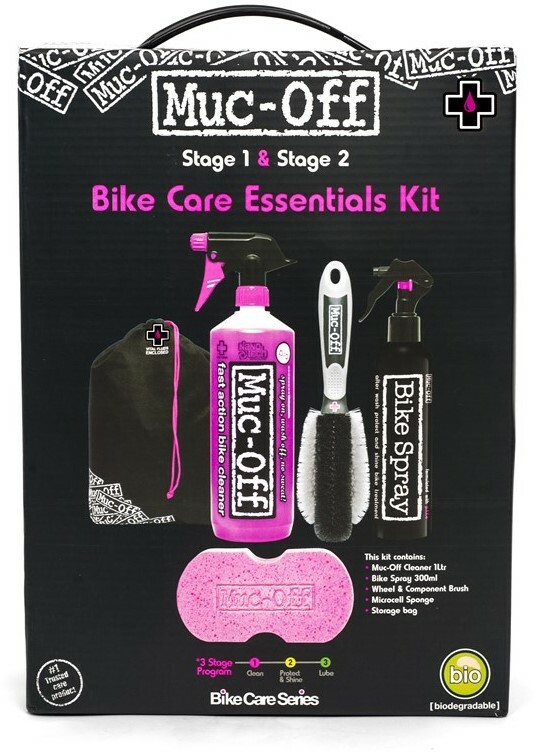 Using a soft bristled brush (such as the Muc-Off Soft Washing Brush) and a suitable cleaning solution (such as the enviro-friendly Hope Sh1t Shifter) start at the top of the bike and work your way down. Note: If your bike has disc brakes take care not to get too much soap onto them, although a little is fine so don’t worry about small splashes. Note: Don’t be tempted to substitute washing up liquid for a proper cleaning solution. They can cause damage to your paint work and the salt content of some can even promote corrosion. Washing up liquids can also be quite harmful to the environment. Scrub the wheels with a brush making sure the braking surface on the rim is nice and clean. If you have disc brakes try not to scrub hard against the rotor – they rely on pad material being transferred into the braking surface. If they are filthy and scrubbing them is unavoidable then don’t worry, they might feel a little weak the first two or three times you use them next, but they will quickly bed in again. Give the bike a final rinse with clean water, bounce it a few times to shake off the excess and give it a nice drying down with a microfibre cloth. Now you’re free to polish and wax it, or you can just get straight down to lubricating it again. 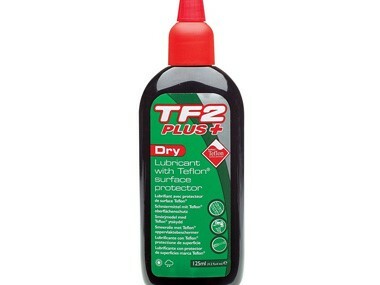 After cleaning your bike, you’ll want to protect the chain and the rest of the drivetrain from the elements. Lubricating these parts both protects them and reduces friction. Warning: Avoid using aerosol spray lubricants, especially if you have disc brakes. It’s extremely easy to contaminate your brake pads with overspray (disc and rim brakes are both affected), and there's little you can do to decontaminate them. Note: WD40 and GT85 are commonly used as lubricants, but the regular off-the-shelf stuff you get in a spray can is anything but. 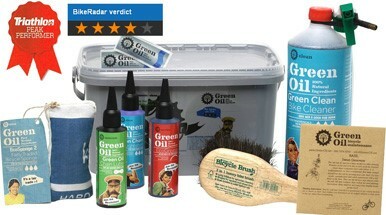 They're easing oils and are great for cleaning your chain & freeing stuck bolts. However, they are totally unsuitable as a lubricant. Which chain lubricant do I need? Dry lubricants are light and thin and form a film over the chain which will help to repel the dust and dirt being thrown up on dry days. However, dry lubricants are not very water resistant, so during rainy day rides the film will be washed off and you may need to re-apply after one or two rides. 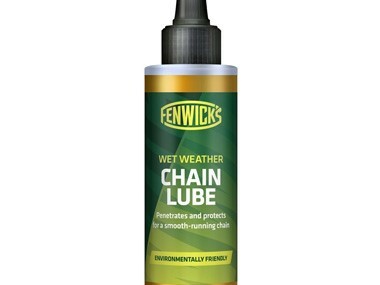 Wet lubricants are designed to stick to the chain better in wet weather. They’re much more resistant to being washed off by rain water and won’t need to be re-applied so often. However, in dry & dusty conditions they tend to catch and trap dirt and grime, which will work its way between the chain links and abrasively wear away at them. 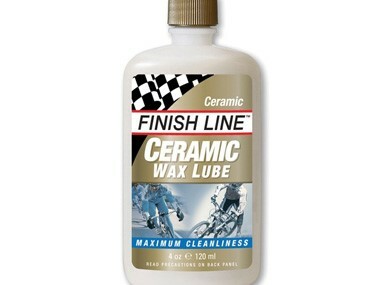 Wax lubricants coat the chain with a protective wax, repelling dust, dirt and (to an extent) water. Wax lubes are almost self-cleaning; the dried wax traps dirt and flake away from the chain. Wax lubricants are more resistant to water than dry lubes, but will need to be re-applied often to keep working their best. They’re also available with ceramic additives for an ultra low-friction coating. And that’s it. Your nice clean bike is ready to go out and get mucky again!